In a large bowl, beat the brown sugar and butter together until combined. Then add in the cream cheese and peanut butter and beat until combined. The beat in the powdered sugar and vanilla until combined. Stir in the chopped peanut butter cups. Place the mixture on a large piece of plastic wrap. Bring up all the corners of the plastic wrap and wrap into a ball. Freeze the ball for about 1 1/2 hours or until it is firm enough to keep its shape. Place the Reese's Pieces on a flat plate and roll the unwrapped cheese ball in the Reese's Pieces. Make sure to press the Reese's Pieces into the cheese ball until it is fully covered. Place the ball on a serving dish, cover with plastic wrap and freeze the cheese ball for another 2 hours or overnight. If frozen overnight, thaw for 20-30 minutes before serving. Serve with Vanilla Wafers, pretzels, graham crackers, fruit, or other cookies. The one part I struggled with was Step 3. I ended up putting it on wax paper in a bowl in the freezer over night. Then the next night I let it thaw a little while , which then allowed me to form it. Then I rolled it in the Reese’s like it said in Step 4, and put it back in the freezer. 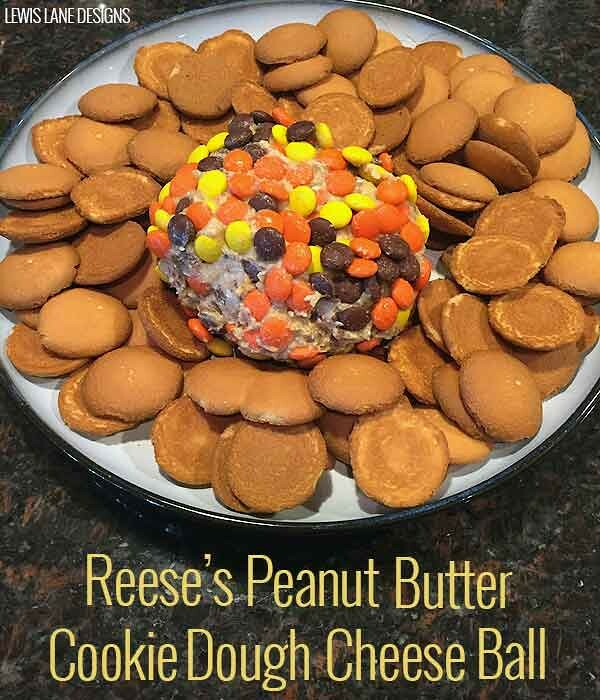 The Reese’s Peanut Butter Cookie Dough Cheese Ball went over pretty well at Thanksgiving. Will definitely be making this again. Perfect for taking to a party or work spread. What in a recipe usually grabs your attention and makes you want to try it? Is it just a good picture that makes you go man that looks good I have to try it? Or is it certain ingredients? If you follow my Pinterest board you will see other recipes that I have been checking out.